Taking his cue from the craft beer concept, Orange native Josh Nichols serves up 100-percent organic, cold-pressed vegetable-and-fruit juice in six packs, growlers, flights and shots. His newly opened venue is located on North Glassell in Old Towne Orange. It’s only 500 square feet, but the newly opened Growl Juice Pub packs plenty of healthy offerings into one small space. 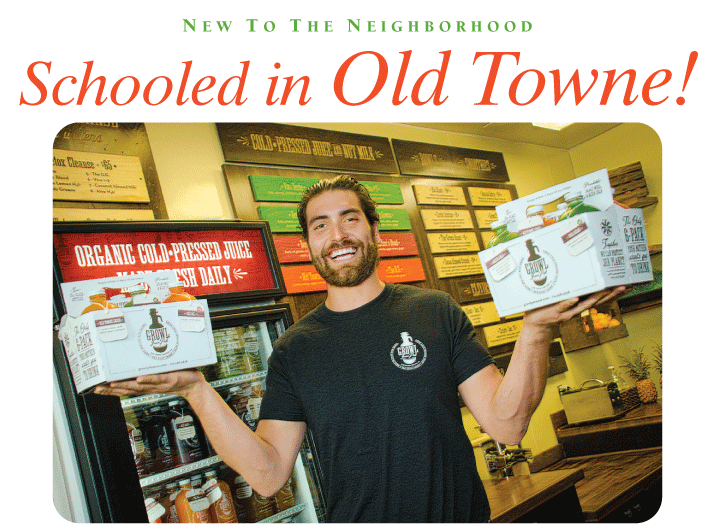 Inspired by the craft beer concept, Chapman graduate Josh Nichols serves cold-pressed, 100-percent organic juice in six packs, flights, shots and glass containers known as growlers. One of the only places in Orange County to offer fresh organic cold-pressed fruit and vegetable juice, Growl Juice Pub is an idea whose time has come, says Josh. Josh makes his juice with a full-scale commercial hydraulic cold-press. The process involves compressing the ingredients as opposed to shredding them with a juicer blade, thus maintaining more nutrients. The result is a three-day shelf life that allows customers to take a growler (16- and 64-ounce options) or six-pack home or to the workplace for consumption throughout the week. Located at the former Metropolitan Crêpes on North Glassell, Growl Juice Pub serves up everything from açai bowls and banana berry smoothies to wheatgrass elixirs, raw nut milks, detox cleanses and waters, and of course, cold-pressed juice. According to Josh, the most popular juice is the Old Towne Crush — made with carrot, orange, apple, lemon, ginger and pineapple. Sustainability is another component of the Growl Juice Pub concept. Customers receive discounts for every glass growler or bottle they return to the store. Born and raised in Orange, Josh says that opening a business in town has been a lifelong dream—especially one that combines his passion for health and well-being.